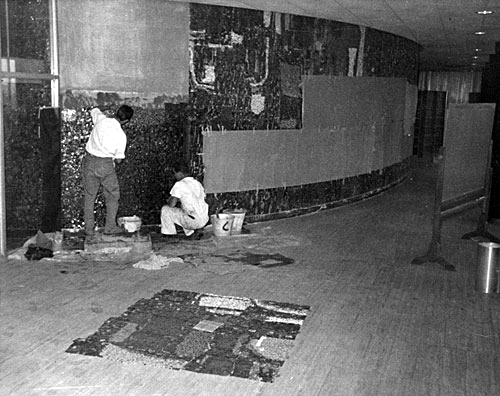 Unfortunately many of the mosaic murals that were created during the mid-century have been torn down and replaced with "modern" updates. 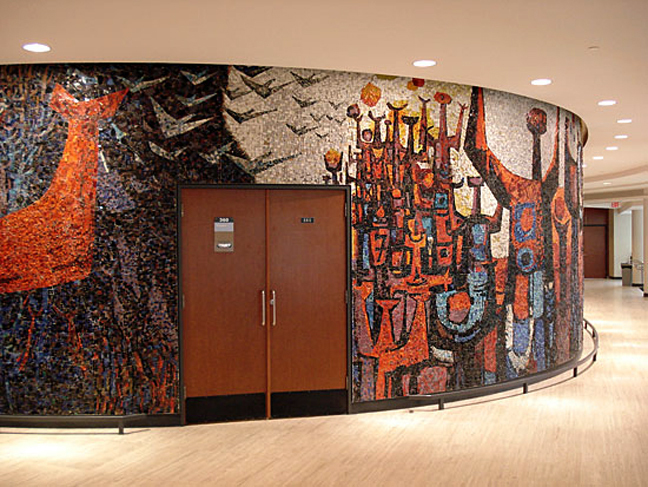 However, this fantastic mosaic titled The Pilgrimage of Man still graces the lobby walls of the Tory Science Building at Carleton University in Ottawa, Canada. 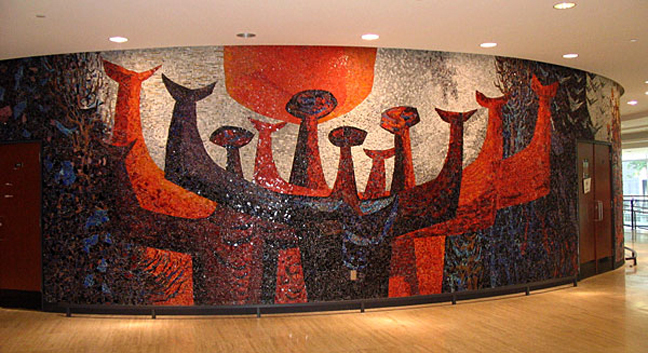 The 11' tall by 168' long mural created with Italian smalti tile was designed by Canadian artist Gerald Trottier (1925-2004) in 1961 and officially unveiled on October 26, 1962. 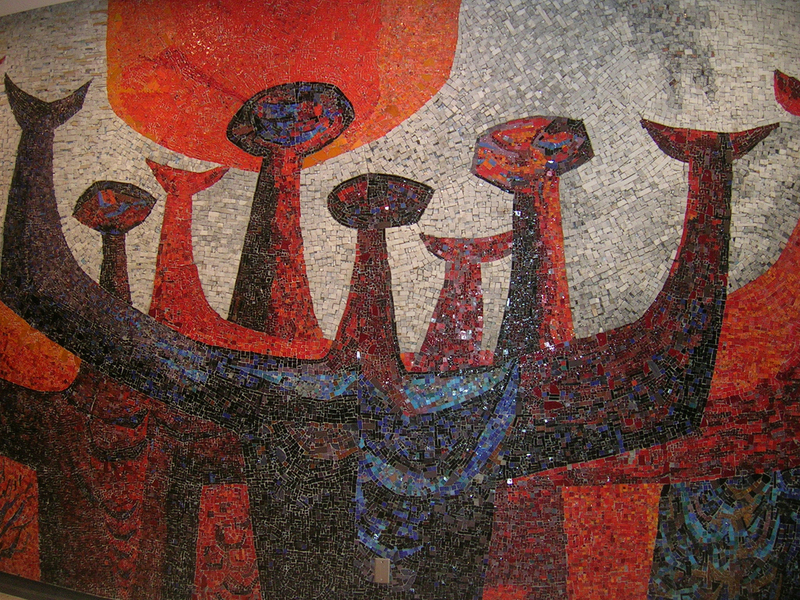 The design for the mural was selected by Carleton University who had issued a design competition for the piece in May of 1961. Gerald Trottier's proposed design was announced as the winner in January of 1962, beating out 8 other entries. 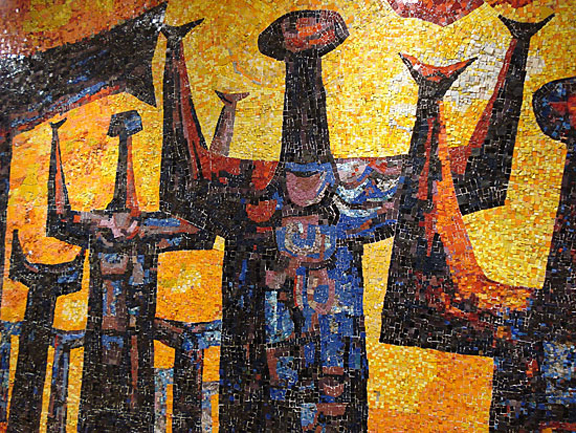 He described the various sections of the mural as follows; the central composition symbolizes "the struggle of man to overcome his environment," the right wall expresses "the seeking of man after truth and knowledge" and the left wall is a "panorama of activities, monuments and testimonials to the application of knowledge." 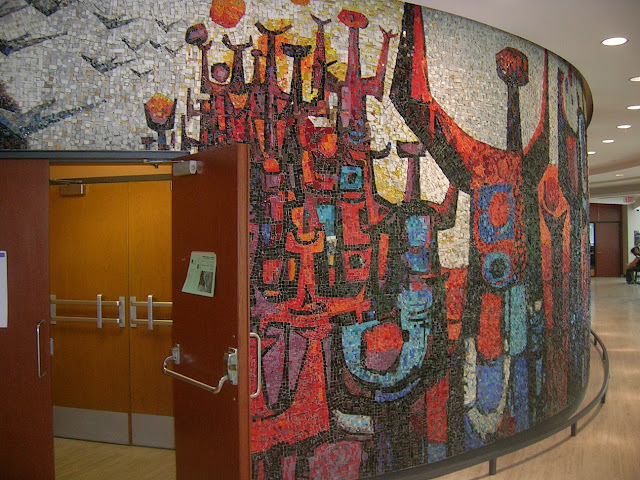 The mural was assembled by the Connolly Marble, Mosaic and Tile Company of Toronto under Trottier's supervision. 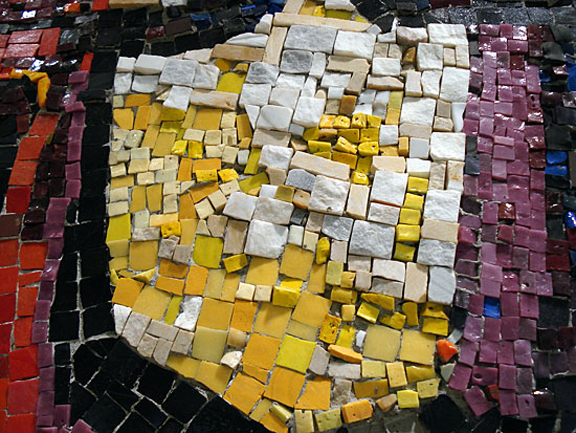 It took a team of mosaic artists following Trottier's color sketches and full scale drawings nearly 10 months to fabricate the piece. 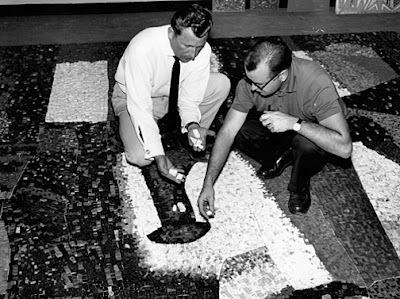 In order for ease of assembly and installation, the mosaic was produced using the "indirect" method; whereby tiles are glued face-down to sheets of paper which are later installed onto a pre-mortared wall, when the mortar sets the paper is removed from the face of the mosaic leaving the finished mural. 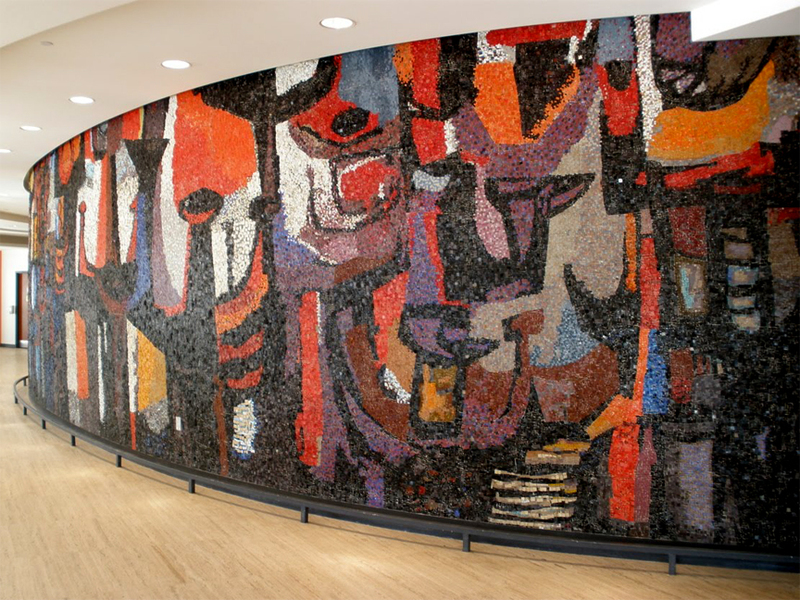 It took about 2 months to install the mosaic in its final place on the wall of the lobby. 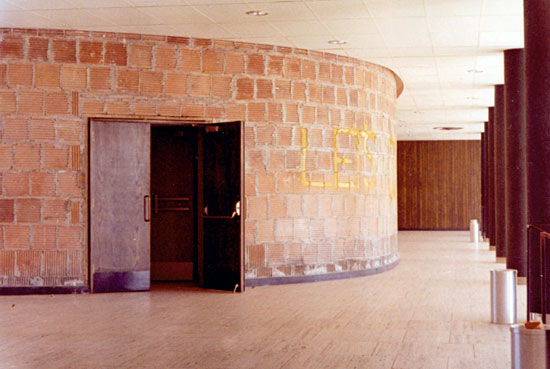 The circular lobby wall of the Troy Science Building prior to installation of the mural. The students painted the wall with the plea "Let's cover this", which is partially visible in this photo. 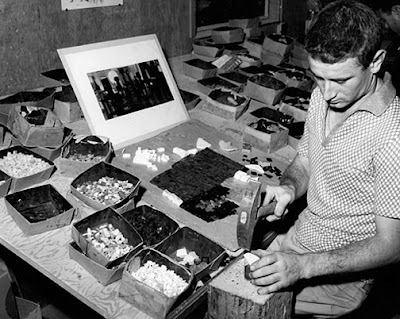 The mosaic artist uses a hammer and hardie to fracture the Italian smalti into pieces that fit into the section of the design he is completing. You can see Trottier's color sketch of the mural on the artist's workstation. Gerald Trottier (right) and art director Alex von Svoboda working on a section of the mural. Craftsmen installing the mural using the "indirect" method. It took about 2 months to complete this step. 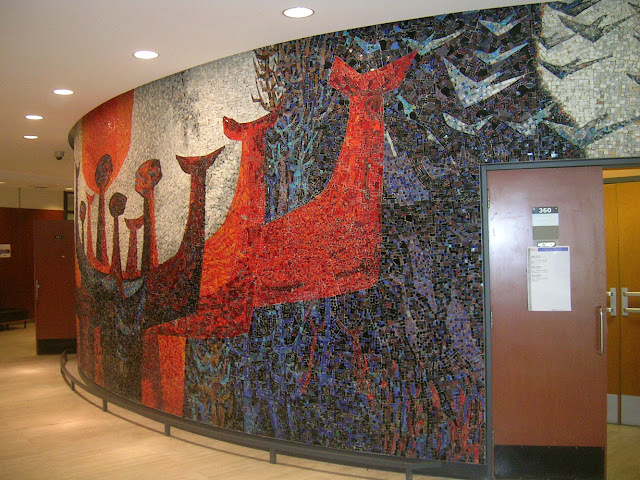 Carleton University has a great site on the making of The Pilgrimage of Man mural which you can check out here. Unless otherwise indicated all images are from the collection of Irma Trottier via Carleton University.